In 2002, a group of local business owners met to explore the idea that local was a community value, that independent businesses built this city, reflect our culture and provide the things needed for a fulfilled life. They speculated that local businesses formed the foundation of a healthy local economy and played a major role in the creative and economic vibrancy of our community. They were right. The local movement began with the grassroots formation of the nonprofit Austin Independent Business Alliance (AIBA) and has blossomed ever since. Now we know that local business is important. Through independent studies and the growing voice of AIBA, evidence of the impact of independent business abounds. Through these efforts and a groundswell of public support, local is indeed a community value. For our customers, it means doing business with your neighbors. It means keeping your money in Austin. It means investing in Austinites and the city we love. Locally-owned businesses nourish the heart and soul of any community. They are, in fact, what gives a community its unique character and identity. It is perhaps this reflection that gives Austin its vast and varied local business pool. While many swim in Barton Springs, many more dip into the pool of independent businesses on a daily basis. This is what brings tourists and newcomers year after year. It is what proud Austinites value—that uniqueness that stakes a claim and says we are unlike anywhere else. 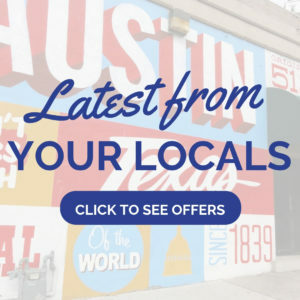 Local is indeed a community value in Austin.